You want your dealership to continue to improve. Sales are good, but you know they can be better. You’re hungry to find new ways to market to interested clients but aren’t really sure how to do so. If you can just get them on the lot, you know you can find a car that will match their needs, wants, and budgets. If someone wants to sell a car, they turn to you. When you’re looking to improve your dealership’s outreach, why not turn to the experts in the field? The automotive marketing companies. Just as you know how to sell a car, they know how to sell your dealership. Dealers that partner with automotive marketing companies have seen their ROIs, their reach, and their revenue increase, so why wait? It’s time to start leveraging their industry expertise and take advantage of what automotive marketing companies have to offer. The old days of interrupting a potential client’s day to bombard him or her with your product are over. Now, companies are focusing on inbound marketing, or in other words, speaking directly to prospects who have presented themselves as interested buyers. An automotive marketing company will help you leverage your website, blog, and social media to turn your marketing around so that every person you talk to is already invested and that much closer to making a purchase. You know your business, there’s no question about that, but do you know where it fits into the grand scheme of the entire industry? Do you know how many people walked off the lot across the street and then purchased from you? Do you know why they did it? By partnering with an automotive marketing company, you can gain insight into the broad workings of the entire industry, not just the ebb and flow of your own. You can start to see trends by watching your metrics and be able to predict and leverage patterns. 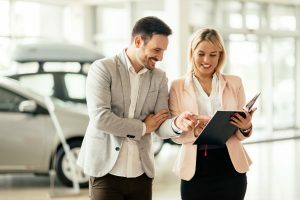 Sales these days are all about knowing the deeper reason behind your client’s actions—understanding the buyer’s journey in the automotive world. How’s your website? Do you even social? Most people these days hit up the internet before even thinking about talking to a person. If they’re not finding your website—or are turned off at the “hip” scrolling text code you still have up from the 90s—then you’re not getting their business. Your website is the first face of your business a client will see, and your blogs and social media pages are how they’ll recognize you as an industry leader. Partner with an automotive marketing company and learn how to make your website enticing and those social posts engaging, interesting, and informative; it’s the only way to bring in clients these days. Your expertise is in selling cars, so you don’t want to spend all your time in the back room managing marketing materials. You should be out on the floor talking with prospective buyers. Instead, your marketing should practically be managing itself. With today’s tools, programs, and strategies, it’s possible. But where do you start? That’s an easy one—call an automotive marketing company and let them teach you. You’re an expert in your field, capable of selling any vehicle; when it’s time to find new ways to bring potential clients to your lot, turn to the experts with the industry knowledge that can help you stand out. These partnerships will mean more traffic to your lot, more opportunities for you to sell, and more revenue in your stream.